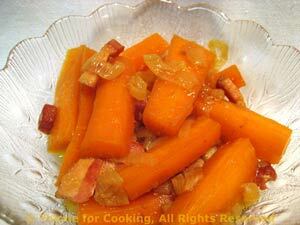 Sauteed Carrots with Bacon, Onions, Thyme for Cooking vegetables. Based on an Italian recipe using pancetta. The bacon works well with the sweet carrots and cooking off the pan juices leaves them with a lovely glaze. Put oil in small skillet and add bacon / Prosciutto, frying until crisp. Remove bacon and all but 1 tbs fat. Add carrots and 1/4 cup water, cover and simmer until done - about 15 minutes. Uncover, turn heat up a bit and cook off pan juices. Crumble bacon / Prosciutto, add carrots and serve.